Transmation Canada was founded in 1977 as part of Transmation Inc, a Rochester, NY based manufacturer. In 1992, Transcat opened its first Canadian calibration lab in Mississauga, ON and was one of the first commercial labs to achieve ISO-9001 registration. 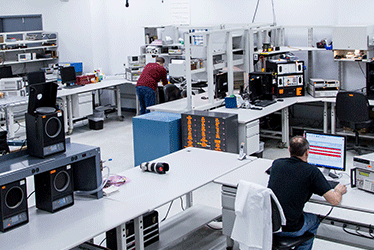 As we grew our operations, we expanded and opened our second lab in Ottawa. Transcat Canada has further expanded our presence in Canada through the acquisitions of other leading calibration companies in Canada. Cal-Matrix, Ulrich Metrology, Nordcal and Dispersion Laboratory are now part of Transcat Canada. Transcat Canada is the largest provider of accredited calibration and dimensional inspection services in Canada. We also offer test and measurement instrument sales and equipment rental through our US parent company, Transcat. Transcat Canada combined with Transcat’s network of labs across North America, offers unparalleled accredited calibration services and dimensional inspection services. As well as weight certification and calibration services, we also offer complete calibration and maintenance services for instruments such as laboratory pipettes, analytical and top-loading balances, temperature measurement instruments and much more. With the addition of Nordcal, Cal-Matrix and Ulrich Metrology, Transcat Canada now services all of Canada with ISO/IEC 17025 accredited calibration services from its four labs in Toronto, Pickering, Ottawa and Montreal. Contact us at 800-828-1470 to speak with a calibration representative to obtain a quote. Transcat offers a unique approach to our position as a leading distributor of test, measurement and controls instruments by supporting inventoried lines with the ability to calibrate and test instruments at the point of sale while offering repair and rental services for these products. Transcat is a industry recognized leader in providing quality, Accredited calibration services, operating laboratory locations across North America. Transcat delivers accurate and consistent calibrations from any of our centers of excellence or at a client’s locations. Transcat(US) Instrument Compliance experts help Life Science companies assess, develop and implement validation protocols for laboratory and storage equipment. We work with clients to develop tailored qualification and validation protocols. Transcat Analytical Qualification Services support a range of analytical instruments. Transcat Consulting Services restores compliance to manufacturing processes with a goal of optimizing instrumentation and selection, calibration intervals, service processes and procedures. Critical analysis includes Out-Of-Tolerance (OOT) non-conformances, risk/measurement assurance, instrument suitability and various elements relating to calibration's impact on the manufacturing process. Why rent? Renting test & measurement equipment can reduce cost and maintenance. It can be a quick and convenient way to get a functional, tested and calibrated (when appropriate) unit with regards for capital requirements, inventory controls, maintenance expenses, and, frequently, at a lower cost for the project than buying a unit. Plus, work with our team of dedicated rental experts for the entirety of your rental process.